When the cold and the snow of winter has settled in, you may be inclined to reach for your big, bulky snow boots, but if you are heading to the office or out for the evening there are better options. A lighter, more stylish winter design is a city essential, especially for day-to-day when the snow isn’t super deep, but it is cold and slushy enough to require more than a pair of shoes. The best walking boots for getting around town in cold weather will have good insulation, a tread that will grip well in icy conditions, and be water-resistant. They should also be reasonably light, blend in well with your clothes and comfortable to walk in. If you are looking for a stylish and warm boot that you can wear to the office or a party, look no further. 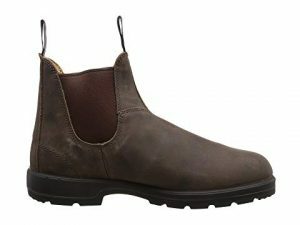 Regular Blundstones are a fashionable city boot in general, but if you are facing wintry conditions, you may want to consider the Blundstone Winter. These are pretty close to the perfect winter boot for trekking around any big city. They take a week or so to break in, but once they do a lot of people consider them to be the most comfortable, warmest winter footwear around. 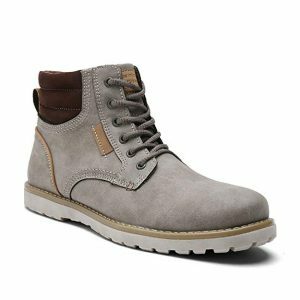 Not only do they look stylish and modern with business or casual attire, but the waterproof nubuck leather upper can also deal with slush and salt and still look good. The Blundstone Winter will keep your feet warm and dry through ice and snow (as long as it isn’t too deep) and everything in between. They have a little bit more insulation than regular Blundstones and come with a sheepskin insole (as well as a regular insole) that you put in or take out depending on how much warmth you may need on a particular day. The sheepskin insole and Thinsulate lining make them warm, while not overheating your feet and making them sweat. The other thing to note about Blundstones is that they are quite lightweight with a durable tread that has a slip-resistant sole. The only downside to this design is they are a tad more pricey than regular Blundstones and only come in one color at this point. If you are looking for a stylish, versatile, and reasonably durable style, you are going to want to take a look at Blundstones. 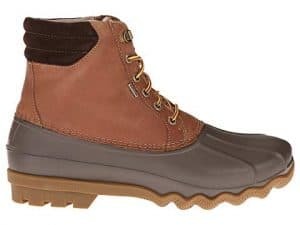 Ugg have a decent number of waterproof winter options that are worth a look, their most popular is the Adirondack, but also check out the UGG Butte. The Butte is warm and stylish enough for city wear without being too bulky and heavy; they are instead quite light and easy to move around in. The leather is waterproof to keep your feet dry, and the lining is UGGpure™, which is a UGG creation made from wool that is made to feel like you are wearing genuine shearling. The Vibram® outsole has a good enough grip that it can easily handle most winter conditions. The Butte is temperature rated to -20 degrees Celsius, so they are warm enough for most winter activities that you are going to encounter in the city. The other notable feature of the Butte is that it is very durable, so you will be able to wear it for years. 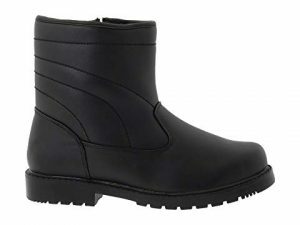 An inexpensive option that is popular on Amazon is the Quicksilk Denoise NY Men’s Waterproof Snow Boots. These are an excellent choice for city walking because they look relatively stylish, will keep your feet warm, and they are waterproof. They are also easy to walk in since they are light and flexible. Most reviewers say they are pretty surprised at the quality and comfort of this design since they cost under $50. If you are looking for something warm, comfortable, and stylish for everyday winter wear and don’t want to spend a lot of money, you should have a look at the Quicksilk from Denoise NY. 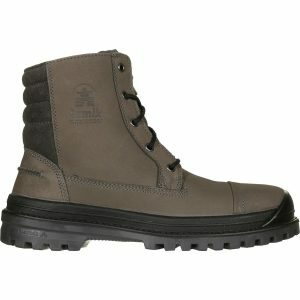 A rugged, yet stylish option from Keen that works well in the city is the KEEN Anchorage III Waterproof Boots. 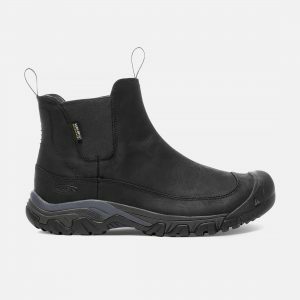 They are designed as an all-season boot, but they have 200g of insulation and are waterproof, with a snow friendly outsole, so they are especially suitable for winter wear. The upper is Nubuck leather that looks good with most styles of pants, and the design is classic slip on so they are quite versatile. They also have a thermal heat-shield footbed to stop cold seeping up from the ground. What is great about this style is it is waterproof, but it has a breathable membrane that can help cut down on your feet overheating and getting sweaty. Since they are slip-on, you don’t have to worry about dealing with laces, and they are easy to get on and off. They are super warm, have good traction, and the simple style means you can dress them up or down. 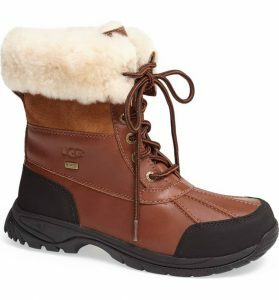 Timberland is another brand that has many winter styles to choose from that are great for getting around town. 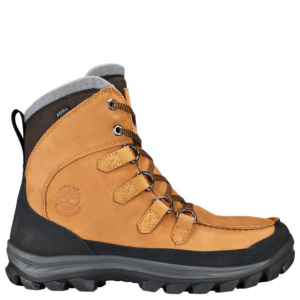 One of their best options is the Timberland Chillberg, they are waterproof, insulated and maintain the style of the original classic Timberlands. 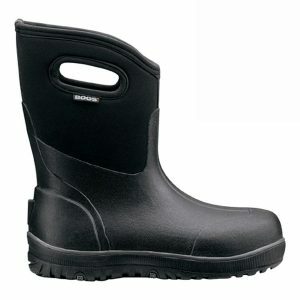 The upper is made of a full-grain waterproof leather along with a waterproof membrane to keep you dry. To keep you warm they have 400 grams of PrimaLoft® insulation as well as a fleece lining. The heavy-duty rubber outsole is said to be reasonably slip-resistant on icy conditions. They are lace-ups and use rustproof D-ring hardware, so you can adjust the fit depending on the type of socks you are wearing. The Chillberg is one of the more eco-friendly options on our list since they use some recycled material within the liner and the leather comes from an environmentally friendly leather tannery. Overall the Chillberg have a reputation for being very warm, comfortable, and fashionable. Kamik is a Canadian brand that makes perfect winter boots. One style for men that work well if you are looking for something that can switch between slightly dressy and casual is the Kamik Griffon Snow Boot. It is a lighter option that will keep your feet toasty warm and comfortable for all-day wear due to the liner that contains 3M Thinsulate that is good to -22F/-30C. The waterproofing on the Griffon also works well, as it does with most Kamik styles. You can get a slightly different design called the Griffon C that is a pull on with no laces. Hunter, the brand that makes the insanely popular rain boots that you see everywhere, have a stylish option for winter called the Hunter Original Insulated Commando Boot. It is an exciting style that combines leather and rubber to create a nice looking prospect for the colder winter days. The Commando is water-resistant (not waterproof), so it is still quite breathable without the sweat retention that you can come across with a fully waterproof option. The Commando is lined with an insulated fleece and has a nicely cushioned footbed for extra comfort. 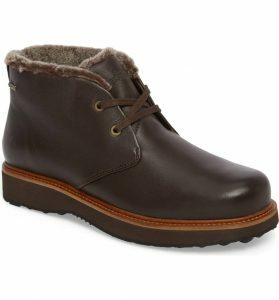 The consensus on this style is that they are wearable right out of the box(no break-in period), the insulation is very warm, and it is a durable boot. Currently, it only comes in black and grey, but the coloring and the design are very subtle and will match with most outfits. Samuel Hubbard is in the business of making super comfortable premium footwear, so their boots are undoubtedly worth a look. The brand started as a kind of an offshoot from the Rockport shoe company, and they have built up an excellent reputation for using high-quality materials with excellent craftsmanship. Samuel Hubbard footwear isn’t cheap, but they are a suitable option if you are looking for a super comfortable, high-quality product that will last. The Winter’s Day is a fantastic style if you are looking for something that will keep you warm and dry, and is also a little bit dressy. It has a shearling lining that a lot of men say makes them feel like they are wearing slippers. They look great, and by most reports are comfortable right out of the box with no break in time. Lastly, the tread on Winter’s Day is a Davos® Ice Sole that uses something called Super Grip technology that will keep you steady on the frozen ground. If you aren’t familiar with Bogs, they are a comfy, insulated rain boot that a lot of people love to wear in the winter. The Bogs Classic Ultra Mid may be a good option for some men for city wear, especially if they are dealing with a lot of slush and are worried about salt stains ruining the leather. They are easy to get on and off, and the mid style means they aren’t quite as clunky as the full-sized Bogs, they are more of slightly above ankle type boot. They have excellent traction and will keep your feet warm and dry while still being reasonably stylish. A popular option for navigating the slush of a big city is the Sperry Avenue Duck Boot. They are lightweight, so they are relatively easy to walk in. The shaft of this design isn’t that high so they won’t be great for deep snow, but the waterproofing properties of this style mean that they will work well for slush or wet conditions. They are similar to the iconic Bean boot style that L.L Bean made famous, but the Sperry version is a little cheaper and a little lighter. By most accounts, the tread works well in snowy as well as icy conditions. They come with a fleece lining that is warm enough for most men for around town type errands or activities. 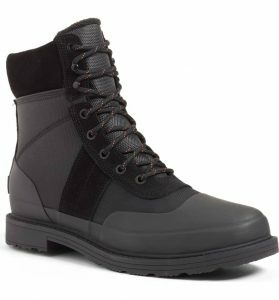 The Abe boot from Tundra is a little more of an old school looking winter style that is easy to wear under a pair of dress pants to maintain a professional look in slushy, wet conditions. What is interesting about the Abe is that it has a side zipper, which is surprisingly hard to find in a men’s boot. The side zipper makes this an excellent choice for anyone with mobility problems or those who have difficulty bending over to do up a shoe. The zipper also means that the boot is relatively easy to get on and off, and you don’t have to deal with laces. The leather is waterproof, and the design is quite broad. They are fleece lined, warm, and have a lightweight comfort that makes them easy to walk in. The other thing worth mentioning is that they only cost around $60, and are pretty decent quality for that price point. 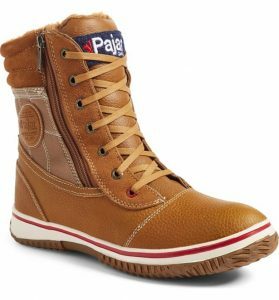 Pajar is another brand that is making innovative, stylish winter footwear that will keep you warm and dry. The Trooper is made from waterproof leather and has a faux-fur lining. One thing that is cool about the Trooper is that it looks like a lace-up style, but it has a side zipper, so it is easy to get on and off without having to loosen the laces. People who own the Trooper seem to love it. Not only do they look great, but they are super warm, have excellent traction, and are so comfortable that you feel like you are wearing a shoe not a winter boot. They even stay clean-looking after being exposed to salt and slush. The only downside is they are a little pricey, although they are durable and well made, so a lot of reviewers consider them to be worth the investment. Tread-Find styles that specifically say they have good traction in winter conditions including being slip resistant or rated especially for ice. Insulation –Insulation is essential in a winter style. There are different levels of insulation, with the most popular being the 3m Thinsulate Insulation that comes in 200g, 400g, or 600g. For walking around town, you probably won’t need anything higher than a 200g level of insulation unless it is freezing or you don’t like to wear warm socks. Some styles include padding on the footbed to stop the cold coming up from the ground. Fleece and shearling are also common materials that are used to keep feet warm. Waterproof– A good winter style is going to be, at the very minimum, water-resistant if not waterproof. Waterproof designs can be great at keeping your feet dry, but they can cause issues with your feet overheating and getting sweaty because there is nowhere for the heat to go. Water-resistant footwear usually has a little bit of breathability to it, so if your feet get too hot the heat has somewhere to go. Height– For a city boot height will not be as much of a concern as it would be if you were shopping for a heavy-duty winter design. You will want to look for a style that at least covers your ankles, but a long shaft that is intended for deep snow is usually not necessary. Material– Some of the leather that is available on the products that we list in this post is either waterproof or weatherproof. Leather is an attractive option for footwear, but remember that it can be damaged by salt and wet conditions. You can treat your leather with waterproofing products like Sno-Seal or buy a style where the leather is weatherproof.